In the middle of a party, an asteroid from a distant galaxy falls to Earth and is taken by professor Bernardi (Carmine Russo) for research. He discovers the asteroid has a substance that can create duplicates from any living being and decides that Italian Spiderman (Franco Franchetti), a fat, rude, and powerful superhero, is the only man capable to have custody of the valuable asteroid. As soon as Professor Bernardi gives Italian Spiderman the asteroid, he is attacked by the terrible Captain Maximum (Leombruno Tosca) who is interested in using the asteroid for his own evil plans. Foiled in his attempt to steal the asteroid from Bernardi, he transforms the Professor into a snake. Captain Maximum later intercepts the Italian Spiderman and takes the asteroid, although he gives Italian Spiderman a chance to win it by beating Maximum in a surf contest. When Captain Maximum notices the obviously superior surfing skills of Italian Spiderman, Maximum attempts to win by cheating. His efforts fail, however, as Italian Spiderman summons the help of penguins (which hurl themselves at Captain Maximum and his henchwomen) and wins. When Italian Spiderman returns home, he is again attacked by Captain Maximum's henchmen, where a tranquilizer dart causes the hero to collapse. Waking up in Captain Maximum's lair he witnesses how the professor is forced to utilize the powers of duplication on one of Captain Maximum's henchmen. Italian Spiderman is forced to watch as the professor is shot by Maximum. The furious Italian Spiderman attacks Maximum's henchmen, killing many in a surprisingly gory battle sequence. Despite Italian Spiderman's efforts the Professor dies but in his last moments gives the Italian Spiderman the potion. Italian Spiderman again attacks the headquarters of Captain Maximum. 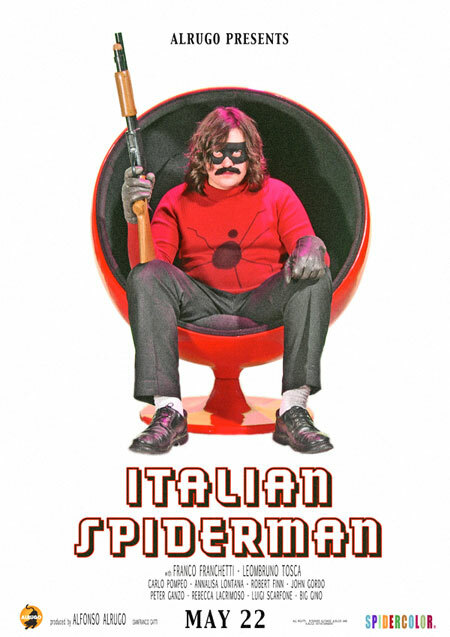 Despite having the potion, Italian Spiderman overwhelms by his powers alone the newfound army (showing in the process to have a poisonous bite and removable moustaches that can double as razor-sharp boomerangs). Later, Italian Spiderman returns home with the Professor's niece. When a gigantic Captain Maximum lays siege to the city, Italian Spiderman finally drinks the potion, growing to the same height of Captain Maximum and battling him until the titles roll. That is some plot for a film that's only 40 minutes long.